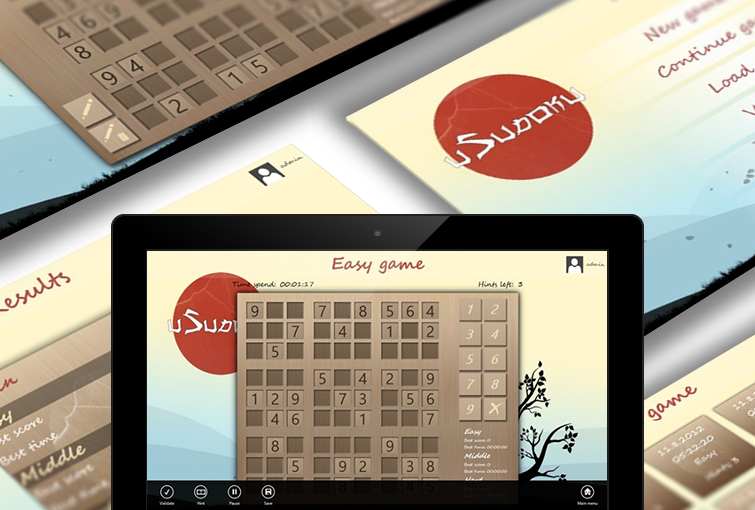 uSudoku application is a simple way to train your attentiveness and develop better logic. It’s based on a classic Japanese puzzle. Make your free time interesting and useful at the same time. Nice user interface and great music will transfer you to old days of Japan and turn you into a real philosopher. Initially the game appeared in Japan and conquered the whole world with its simple rules and captivating game process. The puzzle is a grid shaped as a Latin square of order 9. Some blocks of it already contain digits. Based on them, one should fill the rest of the blocks with digits according to the rules. Game rules: fill the grid so that digits from 1 to 9 appear in each row, column and square only once. Application has several difficulty levels and allows you to track your success every time you play! Each game brings you scores. The faster you complete one game and the fewer solution hints you use, the more scores you will earn. In each game you have 3 hints that open new blocks. They work only when there are no mistakes made in the grid, so pay attention to this. What to do if the victory is so close, but no time to complete the game? Save it and continue whenever you’re ready! Create your own user profile and improve your scores with every game! Nobody will play the game you saved for the later instead of you. Enjoy the privacy! Besides, it’s always easy to make a pause and continue playing without losing any scores. uSudoku app is available for the users of tabs and desktops with Windows 8. The application has 4 languages: English, Russian, Ukrainian, and German. From now on, long travels will be gripping. Make each moment of your free time useful and exciting with uSudoku application! Follow our development team to get the latest app’s updates on @NixS_idev.